Search for Moonboy Apps in the App Store to quickly find them all. Opptomized for iPad and iPhone 5 How it works. 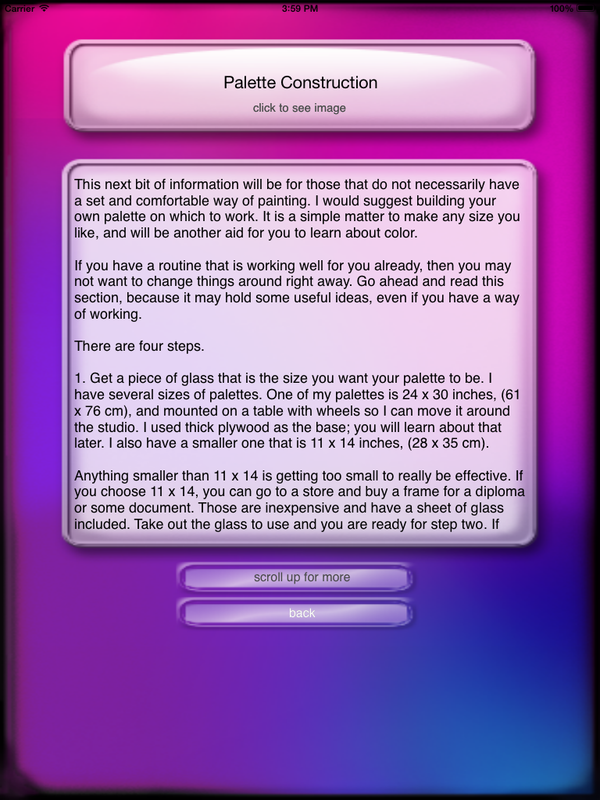 Above is the default user interface for Color Teacher. What's New in Version 1.1; Upgraded for iPad and iPhone 5 . Also the addition of a "Studio Tips" section for artists. Color Teacher explains color in simple to understand terms. Whether you are a traditional artist, a digital artist, a game interface designer, or a web designer, Color Teacher will guide you to a better understanding of color and how to use it. Learn about color schemes and how they work. 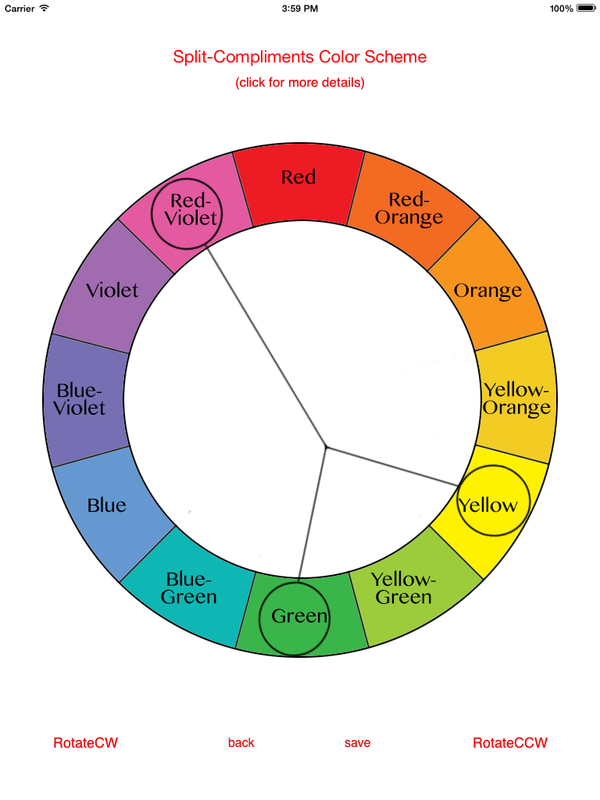 Looking for a way to get better at understanding color in a matter of a few minutes? This is the app for you! "Color Text" is basically a book about color, color mixing, color schemes, pigments, and the science behind our perception of colors. There is even a section showing traditional artists how to build a palette that will aid in learning color theory. 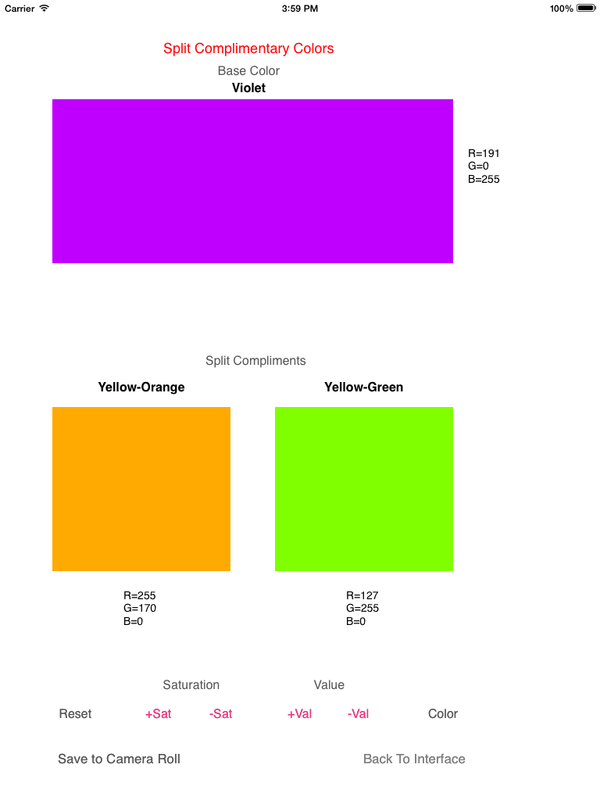 "Color Schemes" lets you see the four main color schemes in action with explanations about each. Rotate the "indicator" clockwise and counter-clockwise for easy reference. "Generate Scientific Palettes" lets you select a base color, and then see other colors that complete the chosen color scheme. You can then alter the Saturation and Value of the palette to meet your needs or to experiment and learn more. "Generate Random Palettes" allows you to choose a category of palette. Color Teacher generates a palette based on your criteria. Click the "reload" button limitless times for limitless palettes. Save the ones you like to your Camera Roll and email them to yourself or a colleague. RGB numbers are included for easy reference. "View Sample Palettes" has a total of 50 pre-configured palettes for you to see and save. RGB numbers are provided with all palettes! 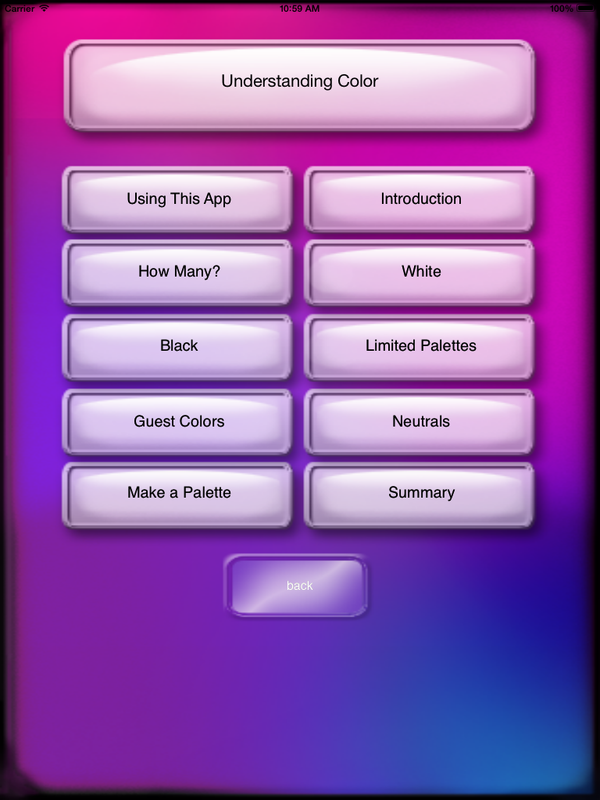 Color Teacher gives you insight and instruction on how to use color in a matter of minutes, and lets you see color combinations at work, and why they work well together. For the digital artists, RGB numbers are provided as you experiment with generating random palettes. 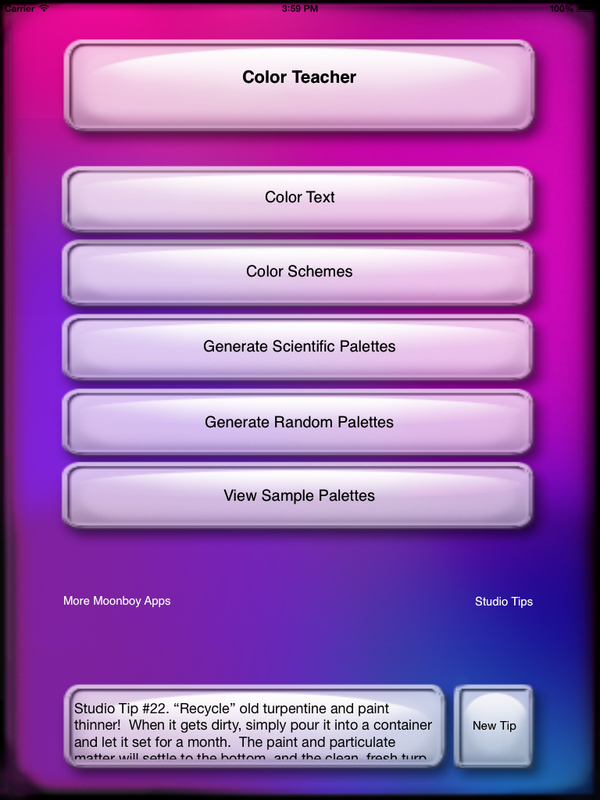 With the Scientific Palettes, you can also alter them with Value and Saturation. Browse through 50 provided palettes, as well as generate limitless palettes to use as-is or alter for your own use. Save any palette to your Camera Roll and you can email it to yourself or a colleague to use on a project. Traditional artists will find the information about the colors black and white useful, and will avoid the pitfalls and mistakes people often make when using those pigments. If you are experiencing problems with Color Teacher, try deleting it from your phone and re-installing. You can either sync your iPhone with your computer to reinstall Color Teacher, (if you have run a sync with your phone with your computer AFTER installing Color Teacher the first time), or download it again from iTunes. You won't need to pay again, as iTunes will remember you have previously installed it. A Color Scheme color wheel with rotating indicator. A Scientific Palette with Saturation and Value controls. The categories from the "Color Text" section. Sample page of the Color Text section. 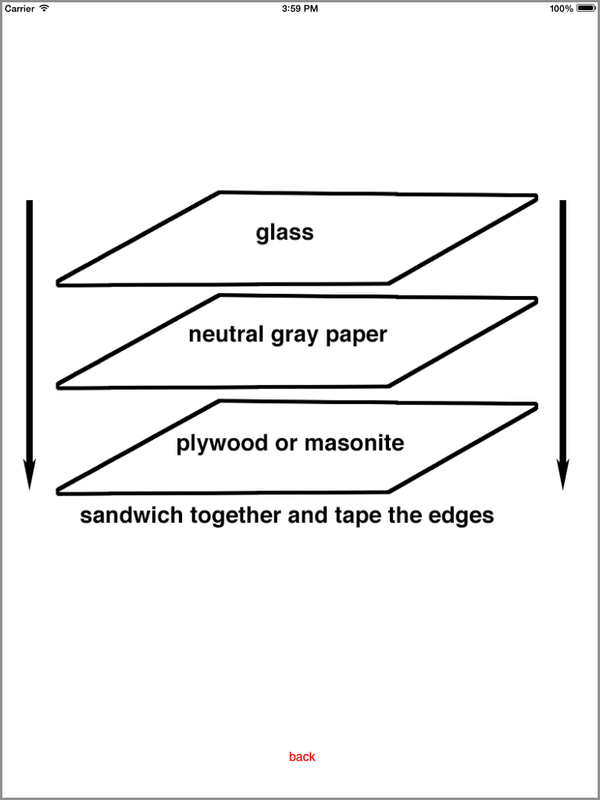 Illustration of building a color mixing palette for traditional painters.